I will be there from 8am anyway, so anyone fancy a full english breakfast on the house, get there before 10am & txt me the night before or early sunday for breakie, so that it is ready prepared for ya!! Won't be driving anywhere this weekend, but hoping I can get Mr Shiver Senior to come and drive it tomorrow so I can get some pics. Cheers mate, I'll give you a buzz if it's not sorted. Paper copy says 2010 so I must be legal, but who knows! -Can any MLR members who have'nt paid the initial £100 please instead bring £135. -And all those that have already paid the £100 can these people bring another £35 to make a total of £135 each. Bank of Budgie has had to fork out almost £1200 out of his substantial federal reserves!! Last edited by rickya; 07 November 2009 at 06:46 PM. good turn out today even though the weather was abit crap. and the red beast is still deed . 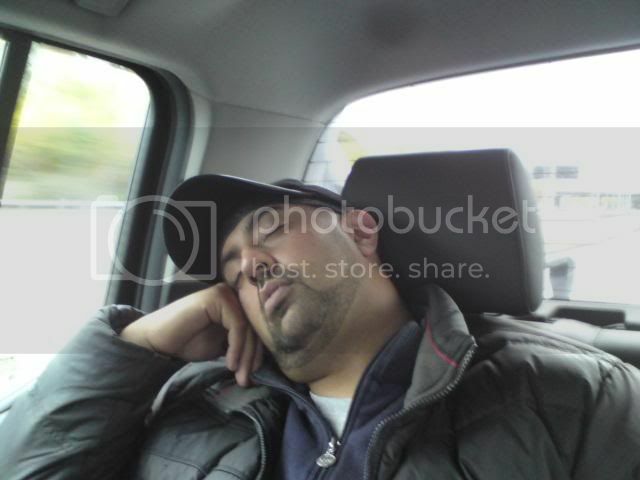 I forgot to put this one up.... this was guv sleeping on the mlr job to northampton. Great two days before my birthday! ps Budgie do you have a list of who has paid up initial fees as Im sure my spread sheet is not complete. I may be missing a few who paid right at the end. This is an event organised by the Lancer Register- specific Misubishi cars can be bought for £500 or less and raced on a grass track for 3 hours in Lincolnshire... it's chaos and a complete laugh! Some pics from last year...ESC won it so we're out to take the title this year! Last edited by Mikee; 04 February 2010 at 09:41 PM. Great two days before my birthday!. Looking forward to us girls showing both the MSOC & the ESC boys how its done!! Great to hear the MSOC will be preparing their vehicles whilst drinking - guess that will give you a better chance this year!